Before you know it, spring will have sprung and the spawning will have already begun! While it may be hard to think about the upcoming spring while you are still snowed in and snuggling by the fire to stay warm, you may want to begin the process of planning your spring fishing trip in the Boundary Waters! Spots are filling up fast at Moose Track Adventures and we want to make sure you get that guided fishing trip you’ve been waiting on all winter! Call today and book your trip to our Ely Minnesota resort before it’s too late! Walleye: This savory fish is hard to catch at any time other than the spring. It is mostly in deep water during the day but since it spawns in the spring, it can be found in relatively shallow water in the very beginning of the season. Smallmouth Bass: When insects come out, these bad boys can be aggressively searching for your lure. You can find smallmouth bass in the streams and lakes with clear waters. Northern Pike: Spawning just after the ice thaws over on the Boundary Waters, this fish can be found in shallow water and areas with lots of weeds. 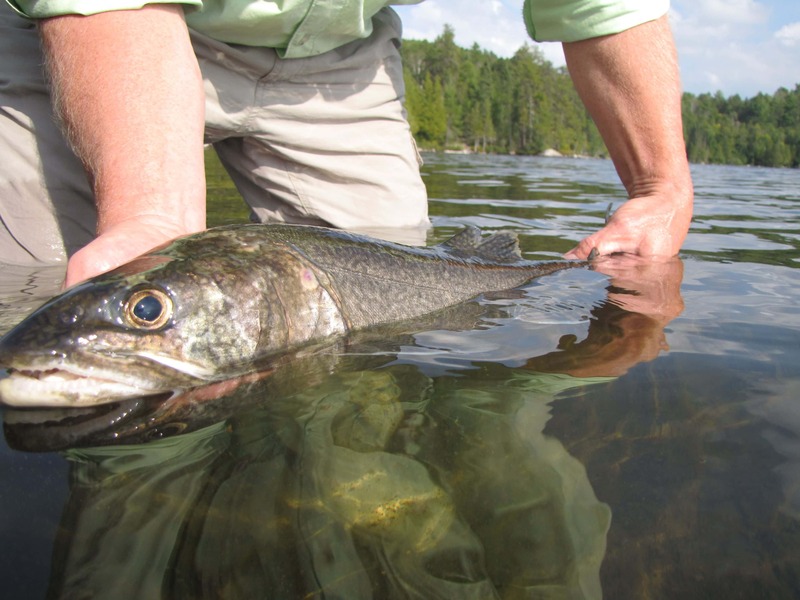 Lake Trout: If you’ve never caught a fish like this, the spring is your chance! Since they prefer cold and clear water, they are hard to find in the summertime as they head deeper in the water to depths of 50 to 100 feet. In the spring, lake trout can be found in 20 feet or less! During your stay, you may decide to choose a guide to show you the best places to fish. Our guides will supply the boat or canoe, the life jackets, permits, and even the bait. We have both full and half day trips that all start around 6:30-7:30 am. The Walleye, bass and lake trout fishing season typically opens 2 weekends before Memorial Day weekend. So stay warm this winter and keep that fire going. As you huddle under your blanket, don’t forget that spring is just around the corner! To book your spring fishing trip on the Boundary Waters of Ely Minnesota, call Moose Track Adventures today at 218-365-4106.